Marieta Island. Photo by: Steve C.
My golly, what a crazy twelve weeks of news it has been. The first quarter of 2019 showed that the economy still had strength as investors bid prices up again after the 2018 fourth quarter deflate. How to absorb all of this noise, and move on? I like a bit of quiet time with the Wall Street Journal and a cup of coffee on the weekends. This particular end-of-the-first-quarter newspaper even had a few pink cherry blossoms stuck to it as I pulled it out of our paper box. How beautiful, the scents of spring blossoms, fresh pressed coffee, and printer’s ink not quite dry on the sunrise edition. And then the crazy stuff begins. Parliament rejected… The FBI has embarked… Trump again threatened… The Justice Department… Emails in a lawsuit… U.S. and Chinese trade… The Red Cross said… The Vatican issued… Lyft shares jumped… and then the clincher… U.S. stocks notched their biggest quarterly gains in nearly a decade, lifted by bets that central banks would hold interest rates at low levels as global growth slows. Patrick, what does it all mean? With the markets regularly acting like a kid bouncing on a pogo stick, you are forgiven if you are wondering what will happen next. In the third quarter of 2018, U.S. stocks (measured by the S&P 500) rose 7.71%, followed by the fourth quarter decline of -13.52%. And just when pundits were calling for continued declines, the S&P 500 rebounded 13.65% during the first quarter. Predicting short-term market movements is usually an exercise in futility, which is why we spend our time looking at long-term valuations on which we base our expectations. While the decline that happened during the fourth quarter made the broad market “cheaper,” it did not move the needle very much, from a long-term perspective. So while we were able to invest in some new companies, at cheaper prices, we still view the broad market as rather expensive. The topic du jour over the last few weeks has been the Treasury yield curve and the inversion of the 3-month/10-year U.S. Treasury yield. On March 22 the shorter yield was higher than the longer yield, thus inverted. 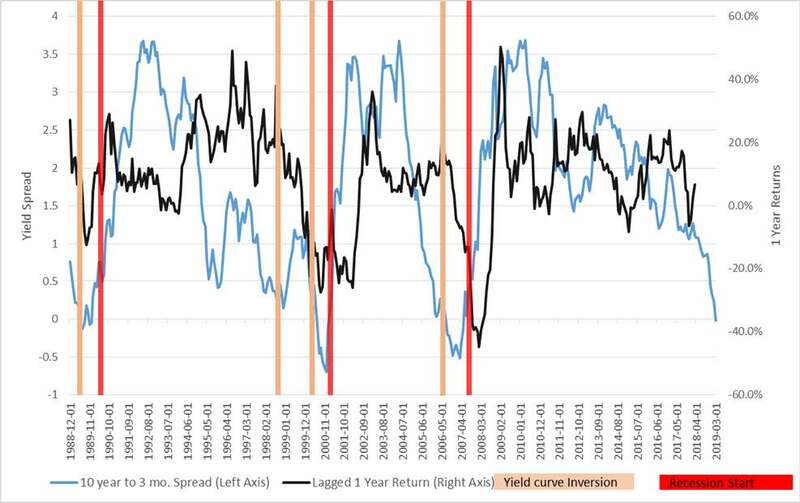 Inversion of the yield curve has predicted the previous nine U.S. recessions with few false signals, so you can see why this news has become so prevalent. News articles and TV pundits will confidently make predictions about the timing ​of the next downturn, but, like many events in both finance and economics, inversion of the yield curve is not always a direct cause and effect relationship regarding stock market returns, or an accurate predictor of when a recession will emerge. The chart below graphs the yield spread versus the one-year future return of the S&P 500 Index. We will not try to guess when the next recession or bear market will start, but we do have a good idea of where we are in this cycle and our research has us acting conservatively. Please feel free to email or call with any questions regarding these topics and how we are managing through them. Thank you! These are exciting times, made more comfortable by having a plan and sticking to it. Maybe we will change Patrick’s name to “Col. John Hannibal Smith” the leader of the renegade commando squad “A-Team”… or not? Please take me up on my standing offer of swinging in for coffee. The pot is always on. The News: Lower inflation has reduced the Fed’s sense of urgency to prevent economic overheating. The Result: The Fed may slow the rate increase pace… I think. The news, and yes, the fake news, is flying through the airwaves at an amazing pace. As someone who attempts to keep track of the investment world, I would vote for a breather so we can look objectively at both the good and the bad economic news. The current U.S. economic expansion has already had a long life. That doesn’t mean it will end now. Periods of growth don’t end just because of old age; they generally end when something goes wrong, such as unchecked inflation, or a bubble in housing prices, or a central bank pushes interest rates up too fast. Patrick is going to cover more of the economics of today in his comments. In general, but not always, our investors’ portfolios performed quite well. Relative returns versus the market can be measured in many different ways; volatility, income flow, relative expensiveness, liquidity, and environmental and social objectives are just some variables. The 4th quarter of 2018 has been tough. But our portfolios are up to the task. Generally, we hold a group of companies that have lower price/earnings, lower price/sales, lower price/cash flows and higher dividends than the S&P 500. Patrick touched on this in our September letter. Please give your reports a good read, and then give us a call. Tim, Patrick, and I are available. Holiday Selfie. Photo by: Patrick M.
Optimism about the economy, and more specifically about equities, clearly faded during the 4th quarter as stocks experienced a U-turn from the exuberance that they had felt during most of the year. The S&P 500 Index closed down -13.52% for the quarter and -4.38% for the year, after posting impressive gains through the first nine months. International stocks fared slightly better during the quarter, only retreating -12.86% for developed stocks and -7.63% for emerging market stocks. High quality bonds and cash were safe havens during the quarter as investors flocked to safety during December. We have spent many quarters talking about the risks in equity markets and how we manage those risks through patience, not paying a premium for growth, and waiting for compelling value investments to come to us. As volatility increased during the quarter, we sent out an email in December describing our investment process. Our viewpoint and process have not changed over the last few weeks. One of the primary areas of financial markets that we feel need to improve, in order for investors to feel comfortable taking increased risk again, are the credit markets (i.e., corporate bonds). During this current market cycle, many companies used the low interest rate environment to issue billions of dollars in debt (bonds) to fund share (stock) repurchases and dividends. In essence this was a large, debt for equity swap, and that changed the dynamics of how companies are now capitalized. This generally has no effect on the financial markets, as long as interest rates remain low and profitability for companies remains high so the debt can be serviced. Concerns over the level of corporate debt start to arise when the interest rate environment and maturity schedule start to change. The Federal Reserve has continued down the path of raising short-term rates, which sends a ripple effect through the rest of the bond market as rates across all risk spectrums adjust accordingly. When rising interest rates combine with slowing corporate profits, which we are witnessing due to higher wage and input costs, and large volumes of maturities need to be rolled over at higher rates, the bond market starts to become more volatile. 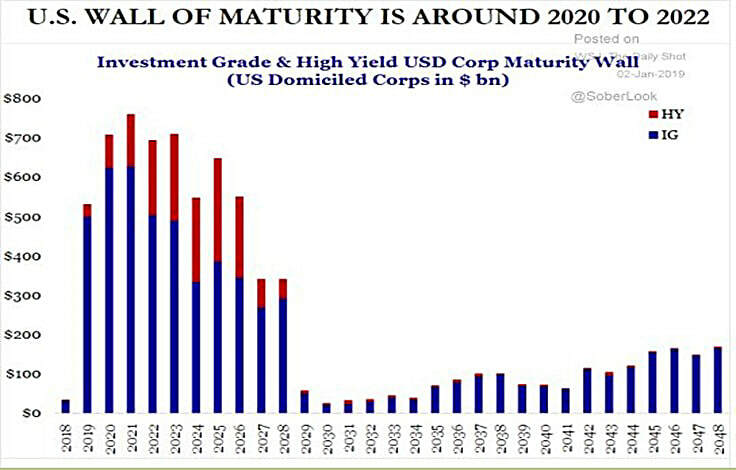 The chart below shows the upcoming maturity schedule for U.S. corporate bonds (both investment-grade and high-yield). 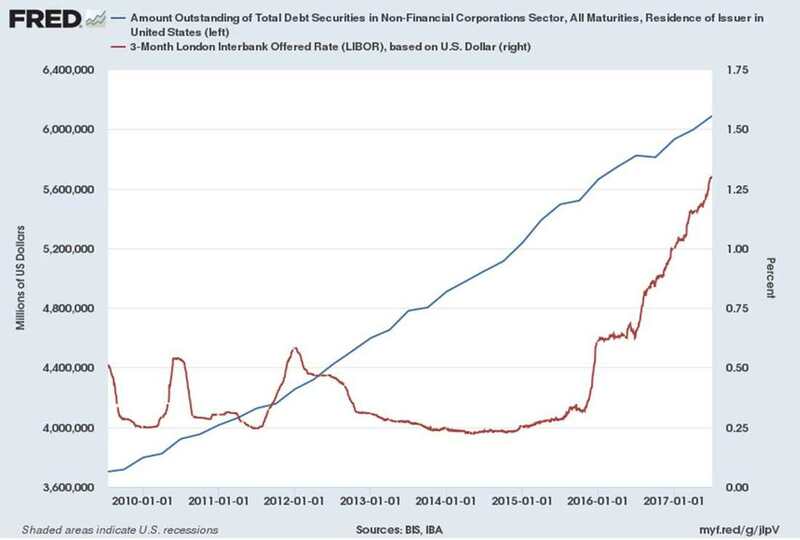 As the chart illustrates, there are large amounts of corporate debt that will need to be refinanced in the coming years at potentially higher interest rates than when the original debt was issued. This should not have a heightened effect for companies that have low leverage and high profits, but will be much more worrisome for companies that already have bloated balance sheets and a lower ability to fund operations internally. When you have excessive valuations in broad U.S. stocks, combined with rising interest rates and economic growth that is showing signs of slowing down, markets can become skittish. Needless to say, highly indebted companies will have some big decisions to make as a large volume of maturities start to take place. Another reason we bring up the corporate debt topic is that the amount of debt and financial leverage a company has is an important part of our analysis when considering an investment. It’s not just the amount of debt that is important; it’s the ability to service the debt with consistency of cash flows and profits while also having the ability to repay that debt without having to issue additional stock. The low interest rate environment of the previous ten years has truly created some interesting times for corporate America as senior management make decisions on how to navigate the next market cycle. Please feel free to drop me a line if you have any follow-up questions or concerns as we navigate through this choppy market environment. The coffee pot is stocked with a new grind of Nossa Familia Coffee medium roast. Seven scoops in a #4 filter make a great 12-cup pot. We are always excited to have investors stop by for a visit at our world headquarters. Smoky Sunrise in the Oregon Canyon Mountains Photo by Tim M.
The unexpected has become the expected, the bizarre has become commonplace, and the unpredictable is where we are. As investors our goal is to purchase equity in companies or debt from a variety of sources at a value price. Later, our goal is to sell equities at a higher price and debt instruments at their maturity value. The single biggest question over the last quarter from our clients has been: “Can this economic expansion keep on going?” The most common concern is that no one wants a repeat of the past recession or corrections. Got it. No easy task. We have found that it is extremely difficult to “time” the market. So we don’t. What we can do is pay attention to valuations and the “expensiveness” of what we own. Expensiveness? Patrick will explain. We are reducing our exposure to market fluctuations by reducing the “expensiveness” of our investors’ portfolios. The U.S. equity markets pushed aside many headline risks to finish up 7.71%, as measured by the S&P 500 Index. Its best quarterly return since 2013. The same could not be said for international equities, as concerns over global trade and growth caused broad-based international indices to return only 0.76%, lagging behind their U.S. counterparts by a wide margin. The large positive return for U.S. stocks over the quarter did nothing to improve valuations, which are near historical highs. We have talked about this numerous times over the last couple of years, so we want to touch on our process and how we are generating positive returns with much lower risk of permanent impairment of capital. Lastly, I will go over some updates that have taken place within the S&P 500 Index which could cause some changes in how investors view certain sectors going forward. As you can see, by all metrics listed (Book Value, Cash Flow, Sales, and Earnings) your portfolios trade at a lower price than the broader market. We believe our focus on valuation, combined with the patience to wait for value, and a disciplined sell process, will provide satisfactory returns if the market continues to levitate higher, while being prepared for when the market decides it’s time for a reversal period. We don’t know when that will happen, but we want to be prepared for that inevitable event as we enter year 10 of this market rebound. My second topic surrounds a new sector in the S&P 500 Index and the reclassification of companies into that new sector. On September 28, the Communication Services sector was created, replacing the Telecommunications sector. The chart opposite shows the changes that took effect and the companies that now make up this new sector. 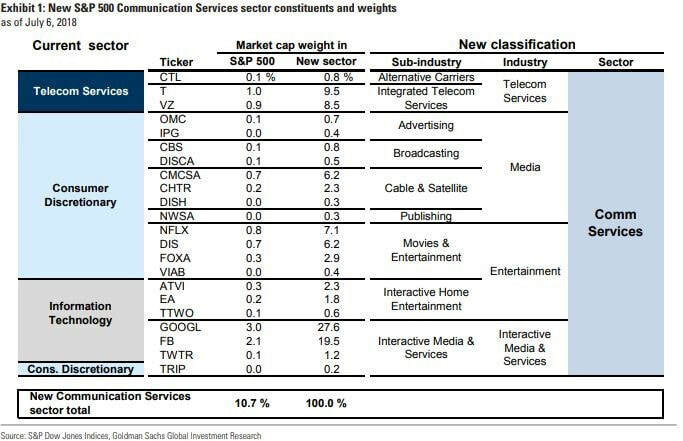 The main takeaway from this change is that the historically “boring” telecom companies such as AT&T and Verizon are going to be included in the same sector as Alphabet (Google), Facebook and Netflix. Needless to say, sector index investors might be in for a much different experience from what they historically had envisioned ​investing in some “old school” communication stocks. Though it’s not a primary point of emphasis in our company analysis, we do pay attention to index representation in the companies we own so we can try to gain an understanding of what might cause excessive volatility besides company specific events. In closing, we continue to find good companies that the market has ignored; however, the number is not as plentiful as it was a few years ago. In light of higher than normal valuations in U.S. stocks, we are pleased that opportunities exist, but remain acutely aware that risks are higher than normal. Thank you for your continued trust and please drop me a line if you want to discuss any of these topics in greater detail. Thanks, Patrick. Please take him up on his offer to talk about anything related to his analytical work. Company Spotlight :: PACCAR Inc.
Headquartered in Bellevue, WA, PACCAR is a global leader in the design and manufacturing of light, medium, and heavy-duty trucks. The trucks are sold worldwide under the Kenworth, Peterbilt, and DAF names. PACCAR also designs and builds engines and powertrain components for its own use, and for sale to third parties. Ron Armstrong has been the CEO since 2014 and has spent over 20 years with the company. Originally founded in 1905 as a railway and logging equipment manufacturer, PACCAR became a heavy-duty truck manufacturer in 1945 with its acquisition of Kenworth. Since this transition over 70 years ago, PACCAR has become the global leader in truck manufacturing. Their high degree of product customization and brand name recognition has allowed them to maintain a strong competitive advantage. As an example, PACCAR controls over 30% of the heavy duty truck market share in the U.S. and Canada while generating operating margins in excess of the major competitors on a consistent basis. Over the last 18 months PACCAR has been focused on technological advancements with the opening of their Innovation Center in Northern California. This group has partnered with chip maker, NVIDIA, to develop self-driving technologies for trucks, and has developed hydrogen-fuel-cell powered trucks which emits only water vapor at the tailpipe. PACCAR’s strong balance sheet, focus on operational efficiency, and consistent cash flow generation (over $2 billion annually) allows them to invest in projects that will continue their leadership position in heavy duty trucks. PACCAR is trading at attractive valuations compared to both historical operating performance and to free cash flow projections. PACCAR is trading at 1.09 times sales and 9 times operating cash flows which is over a 15% discount compared to its five and ten year averages. We expect the company to grow free cash flow along with overall economic growth which is averaging 2% after inflation. This is well below their historical growth rate as the economic cycle shifts towards the later stages of growth. If our conservative assumptions turn out to be overly optimistic, there is a margin of safety built into the current price based on the company’s current valuation compared to its historical operating performance, and strong financial position. Risks that we will monitor going forward surround market share strength and growth in the heavy truck market. Weighing both potential rewards and risks, we are optimistic PACCAR will be a good long-term investment. Summer sunshine is warming us up in the West. It feels so good! The last few days have been the hot type, where individual bones in your spine feel like they are melting out the last of the ice and chill of winter. The stock market has also been hot for a while. But not all parts or sectors have been feeling the heat. Frustratingly, the hottest sectors and companies are also the most richly valued companies and hence not attractive to us as value or momentum investments. The purchase prices of our investments are of paramount importance to us. Time can heal a lot of investment wounds, but it is most difficult to recover from overpaying. I hope the world is laughing with me when I ask, “Have you noticed the volcano of crazy, off-the-cuff, wacko ideas and plans that are being trotted out, run around the test globe and then re-evaluated?” Probably the biggest, loudest worries are coming from trade-war concerns. This has fired up volatility in currencies and stock markets around the planet. There is a lot of noise about potential longer term effects from tariffs and trade wars on U.S. companies and in particular industrial manufacturing. Please remember that manufacturing is only about 12% of GDP and we are in the 1st inning of a potentially long, hot, and politicized season. Patrick and Tim are both itching to add to this quarter’s letter, so I shall go back to the dugout. The proposed DOL Fiduciary Rule, scheduled for implementation last year, was delayed numerous times before being terminated through court action in June. The courts determined that the Department of Labor had overreached its authority and that the topics addressed are better dealt with by the SEC, which in most other ways is responsible for the regulation of investment advisors. Cairn at Shorngate Cross Currick on the Northumberland Durham County Boundary. Photo by Tygh P.
What was this “DOL Fiduciary Rule” and why is this topic important? The growth of the employer sponsored retirement plan, such as the 401(k), has been tremendous over the last 35 years, with combined assets now above $6 trillion. These employer sponsored plans are now the primary tool for retirement savings, with fewer than 2% of Americans being enrolled in a traditional pension plan. The financial security of our next generation of retirees depends heavily on the success of these newer plans. This explosive growth has attracted much attention from the financial industry, which provides the investment platforms for these plans and for the various “Individual Retirement Accounts” or IRAs. Holding these assets, managing them, and providing advice on them is good business, and a core profit center for almost any investment oriented financial institution (Fidelity, Vanguard, Cairn, etc.). For decades the employer sponsored plans have been tightly regulated by ERISA (Employee Retirement Income Security Act). IRAs and the transfer of assets from employer plans into IRAs (rollovers) are not generally subject to ERISA. Some business models in the industry are intently focused upon this rollover process, and, like all great business opportunities, sometimes the interests of the consumer get overshadowed by the interests of the service and product providers, particularly without specifically designed legislation. The DOL rule set out to fix this by making everyone involved in the process a“Fiduciary,” someone who must be true to the consumer and put the consumer’s interests first. This has caused major shifts in the industry, as firms were forced to evaluate their business models to determine how they were at risk of violating the new rule, how to eliminate conflicts of interest, and how to implement the prescribed procedures that came with this rule. An example of this is that Vanguard stepped away from advising clients on IRA assets. How could they maintain fiduciary standing when advising clients to purchase Vanguard funds? With the funds themselves being Vanguard’s primary business, they quickly and preemptively made the decision to stop advising. For Cairn and other fee-only investment advisers, the DOL Fiduciary Rule had a much lower impact as we already were, are, and will continue, to act as a fiduciary. For us the change was the implementation of some required documentation that detailed why a rollover or IRA transfer was appropriate in each circumstance. The DOL rule is dead, but the genie is out of the bottle, with many firms continuing to implement planned changes with the expectation that the SEC will soon roll out their own rules with a similar goal of improved consumer protection. What may be different is a more nuanced approach by a more informed SEC that recognizes the difference between commission-based brokers and insurance agents, and the fee-only advisers who are already acting as fiduciaries. Time will tell. For now you can be assured that we will continue to act and advise in your best interests as we wait for the regulators to sort things out. Last fall I wrote about inflation and how the slow growth in average hourly earnings was not matching the inflation worries that were being discussed by market pundits. Recently, with the passage of individual and corporate tax law reform, growth of average hourly wages has started to pick up. The chart below shows a measure of corporate profit margins (red line) and the year-over-year change in average hourly earnings (blue line). 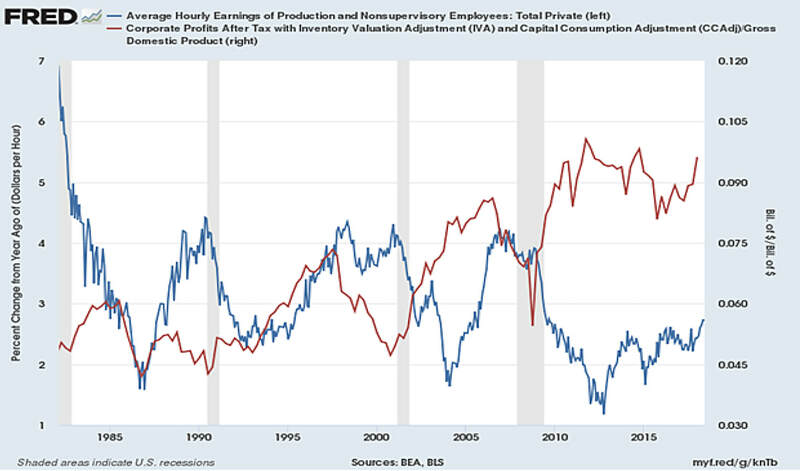 As you can see, these two lines tend to move in opposite directions; the higher wage growth tends to be, the lower corporate profits tend to be. Inherently this makes sense, although many factors determine overall corporate profitability. The salaries paid to employees are a large fixed cost. Contrast this expense with, for instance, the cost of raw materials, which can be adjusted based on short term dislocations between supply and demand. The takeaway from this chart is that higher wages should depress corporate profit margins, which are already sitting close to an all-time high. The possible retreat in profit margins due to higher wage costs is currently not being priced in by market participants (let alone higher input costs if large tariffs take place). As we continue to navigate a market that is on the expensive side, we continue to watch for other indicators that could change the corporate landscape. Rising wages are one data point we are keeping a close eye on. Our investment discipline helps combat these possible pressures as we consistently look for market leaders that have the ability to pass on higher costs to their end customer, regardless of the type of industry. We firmly believe that risk management is of high importance as we get to the later innings of the market and business cycle. However, we are still finding opportunities in the marketplace, and we will take advantage of them if the price is right. Please feel free to reach out to me with any questions regarding this or any topic. As I’m fond of saying, please come on by when you are near. The coffee pot is always on. How many of you have taken a trip to one of the fabled movie lots in California or elsewhere across the country? Movie lots where fabulous, action-packed scenes have kept us all at the edge of our seats. Well, that’s where I feel we’ve been. I can see and feel, almost taste, the dust in the clapboard buildings. The peeling paint, a couple of window panes broken out. Maybe a curtain flapping in the breeze through the broken window. I can smell dust, maybe I can smell the livery stable, maybe I can smell a little coal smoke, maybe someone cooking. And here we are on a quiet Easter weekend and April Fools’ Day, when out of the East, with the sun to his back, comes a wild cowboy with pistols in both hands. The bullets begin flying and I start dancing, I jump up to avoid a bullet hitting my ankle, I dodge to the left, I dodge to the right, I keep on dancing as the bullets fly around me. Breaking another window, splintering some other wood boards, and of course punching a couple of holes in that classic water trough near the livery. This is what the last few months have felt like, unplanned, and very unsettling. It may be that disruption is the way to get people focused on the issues that our country needs to address. But, my gosh, it is difficult for the markets and investors to have a sense of stability with all of the disruptive, High Noon activity. Over the years many of you have heard me say that I don’t worry too much about the markets overall. What I care about are the individual companies that we own. Companies where folks are making decisions daily on how to make their business more profitable, more appropriate, and more relevant. These are the things that I’m focused on, and it may be that the business environment is changing in a positive way. Earnings, dividends, backlog of work not yet done, promising future new technologies: These are important to me as we wrap our thoughts around what we as investors should own. In the past I’ve talked about our wall of worry. I’m not going to do that. From time to time I’ve talked about interest rates. I’m not going to do that either. But I do think there is a change in the way businesses are being managed from a tax perspective, and how we need to think about taxes and the way we own our investments. How we as investors are going to act and how it may have an effect on our returns. Patrick is going to take an important part of the message today and reflect upon the changes that we see in the way companies are aligning with new tax rules and with increasing interest rates. 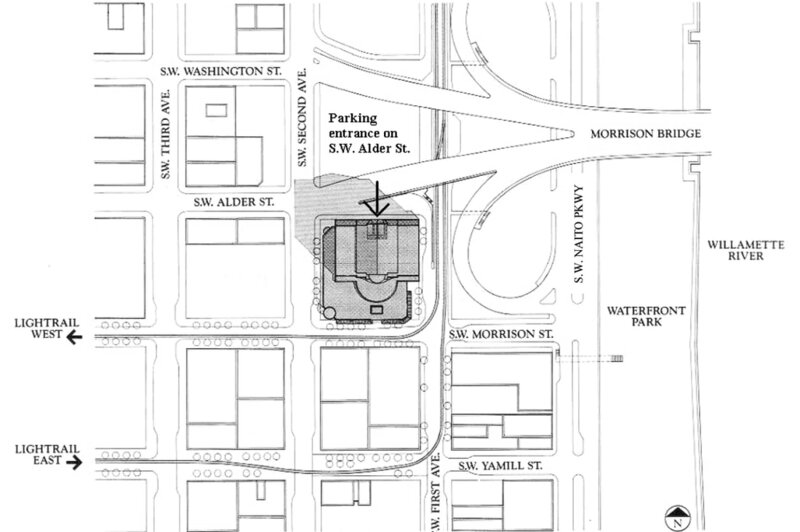 ​I would encourage you to call up and schedule a time to come and see us. If you haven’t had a chance to talk with Patrick and/or Tim lately, it’s a great thing to do. Any of us are happy to sit down and review your world and your investments. Patrick has been with us nearly three years and has a wonderful handle on so many of the companies we invest in. One of the tragedies that we bumped into recently is that Theresa, who was absolutely delightful to have on our staff, has become one more casualty of the very difficult daily commute from Southwest Washington into the Portland Metro area and back. That being said, we are very excited about introducing you to Kim Weatherman. Kim is well experienced, a veteran from banking, insurance and investment firms. She most recently was with Columbia State Bank headquartered in Tacoma, but working here in one of the local Portland branches in its small investment arm. Please join me in welcoming Kim and don’t hesitate to give her a shout and say hello. It is comical that we now have a Jim, a Tim, and a Kim. We just try to say it clearly for each other. 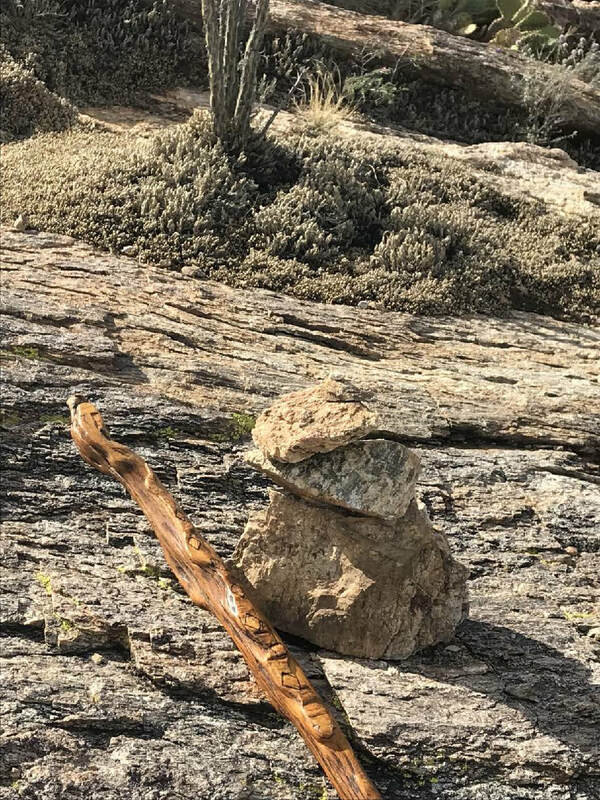 Tanque Verde Ridge Trail, Saguaro National Park. Photo by: Ted H.
Many of you have heard me talk with enthusiasm when it comes to my belief that the economy will continue to march along, sometimes at a bustling rate and sometimes slower. Currently we are at a fairly brisk rate, and that’s a “good thing” for investors. So, as I often do, while driving down the road and see other people in their cars, or if I’m in the office and look out and see other office windows or other business doors, I remember that behind every single one of those cars, businesses, or offices is somebody just like you and me, trying to figure out how to put some more money in their wallets for all of the things that they would like to do in their lives. It’s a very compelling economic growth story. As we see businesses hiring more, we are enthusiastic about an ongoing improving and growing economy. That being said, we all know that if there is one thing that causes jittery markets, it is uncertainty, and right now we have a lot of uncertainty. So much for the low volatility that investors have become accustomed to over the previous couple of years. The first quarter saw markets rise to an all-time high by the end of January, only to finish the quarter in negative territory. The S&P 500 Index finished down 0.76% for the quarter while developed international stocks fared a bit worse, -2.2%. Emerging market equities fared the best of the major asset classes, returning over 2.4%. Bonds were also mixed as yields were quite volatile, reflecting consistent economic growth while the U.S. Fed continues on its interest rate hike path. As we have written previously, we view broad U.S. stock indices as richly valued and that view has not changed during the quarter. Finding bargains in this environment is challenging but we remain vigilant in our search for quality investments selling at compelling prices, while decreasing our exposure to companies that have become more fully valued. As Jim mentioned, I am going to discuss some of the changes that companies will be facing regarding tax rates and the rising costs of borrowing. Last quarter we briefly touched on the changes in tax law that focused on individuals. There was also a broad overhaul to the corporate tax structure that many companies are still trying to dissect three months after the fact. The two primary changes that are being talked about the most are the lowering of corporate tax rates from a high of 35% down to a flat rate of 21%, and the changes to the deductibility of interest expense on corporate debt. The latter change is not talked about as frequently, but could be of more importance in the years to come. We spent a lot of time in early 2017 identifying companies that could benefit the most from a lower corporate tax rate. That benefited portfolios later in the year, as companies with high effective tax rates were strong performers in the back half of 2017. Companies that benefited the most had similar qualities: low debt and a large proportion of U.S. revenues. The use of funds that companies are netting, resulting from lower tax, is still not completely clear, so it will be interesting to hear executives speak about their plans during upcoming earnings announcements. While an increase in productive spending (research, capital equipment, employee training and technology enhancements) would be welcome news, we remain skeptical, as historically tax savings have been used to increase executive compensation and share buybacks. Also, the increased chatter of trade tariffs/wars and possible effects on corporate profits could weigh on the benefits that were perceived from lower corporate tax rates. A very important part of the tax law change surrounds the deductibility of interest expenses for corporations. Historically, the interest expense on the debt issued by companies was fully tax deductible. Over the last 10 years, this allowed these firms to access the bond market at historically low interest rates and have the interest expense be tax deductible (what a deal!). Under the new tax law only part of the interest expense is tax deductible (up to 30% of operating earnings before depreciation). Companies that have large amounts of debt or increasing interest expenses are now more susceptible to lower profits. We feel this is a risk that is currently underappreciated by equity markets. As the chart below shows, corporate America has taken on large amounts of debt over this past cycle, rising from roughly $3.6 trillion to over $6 trillion. This is at a time when the costs of corporate debt have started to rise (indicated by the red line, 3 month LIBOR). See chart below. As interest rates have begun rising in the corporate market, this creates a headwind surrounding balance sheet strength, financial flexibility, and corporate profitability going forward. While we continue to look for attractive investments, these potential headwinds will be considered. We always strive to invest in companies we feel are financially healthy. Financial health and cash flow strength could separate the winners from the losers as we reach the later innings of the market cycle. Where we cannot find these suitable investments, we are comfortable being patient to protect against downside risks. We will get past this tariff noise. We’re going to continue to keep our eyes open and try to dance around those surprising puffs of dry dust that are poofing up near our feet. Please remember that any time you are in town we’d love to see you. Don’t hesitate to come on in. The coffee pot is always on. Company Spotlight :: Cardinal Health Inc.
Headquartered in Dublin, OH, Cardinal Health is a pharmaceutical distribution and medical device company. The company provides its services to healthcare providers, pharmacies, and pharmaceutical manufacturers. With the company since 1990, Mike Kaufmann became CEO on January 1, 2018. Cardinal Health is the third largest pharmaceutical distribution company by revenue behind McKesson and AmerisourceBergen. The company is the largest supplier to CVS pharmacies. In 2014, the two companies started a joint venture for generic drug sourcing and distribution, forming the largest generic drug sourcing entity in the US. The high barriers to entry in this space allows Cardinal Health to produce consistent and stable operating results as their large distribution network would be hard to emulate for a new company entering the market. In recent years, the company has expanded into medical device manufacturing and distribution via internal development and acquisition of Medtronic’s patient recovery business (professional products for patient care). This 2017 acquisition furthers their focus on higher margin medical products and distribution, generating roughly $2.4 billion in additional sales. The acquisition will complement the company’s strong supply chain management and large customer relationships allowing them to generate significant cash flows even in a low margin business. A leader in pharmaceutical distribution services. High barriers to entry allows for consistent cash flow generation and high operational efficiency. Good financial health with over $1.2 billion in cash and net debt to capital of 50%. Consistent and growing dividend with a yield of 2.75%. Cardinal Health is trading at a discount compared to its historical valuations and below fair value based on scenario analysis of free cash flow growth. Cardinal Health has a dividend yield of 2.75% and generates over $1.5 billion in free cash flow to give them the flexibility to continue to raise their dividend over time. On a free cash flow basis, we expect the company to grow cash flow at 3.0% annually over the next decade. This is below its historical growth rate due to higher pricing pressure on pharmaceuticals and high revenue concentration. Modeling our conservative assumption places a price of $80 on shares, which is almost a 21% premium, based on the price as of the date of this report. If our conservative assumptions turn out to be overly optimistic, we feel there is a margin of safety built into the current price based on the company’s high returns on capital and strong cash flow generation. Though Cardinal Health has only two main competitors in the pharmaceutical distribution business, it is a highly competitive environment. We would like to see continued discipline in regard to capital spending while continuing to grow their dividend. Continued focus on the company’s revenue breakdown, along with integration among its recent acquisition, will be areas to monitor closely. Weighing the potential rewards and risks, we are optimistic that Cardinal Health will be a good long-term investment. 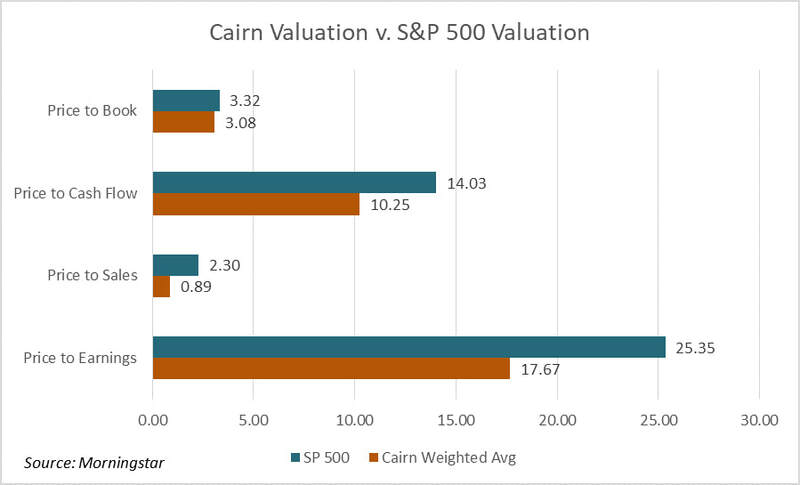 The essence of these reports from Cairn to you, our investors, should be primarily focused on you, the investment results and some sort of a gaze into the future, and thinking about how that future might affect the way we handle our investments. This time I’m going to start with a more personal note. Lara and I had a chance to meet up with our son, Tygh, who is an exchange student from OSU Forestry Engineering Program to the École Supérieure Du Bois in Nantes, France, focusing on International Timber Trade. Well, that’s a tongue twister of a sentence. We had a wonderful opportunity to spend Christmas and the New Year abroad. It was an unusual time to be out of the office as we went from one year to the next. Especially when there was so much news about potential, and eventually real, tax law changes. Patrick is going to pick up most of the load, describing some of these changes for us. Tim is going to update us on the phenomenon known as Bitcoin. And in general we’re going to be focusing on some of the things that we find particularly important at Cairn to keep all of our investment energy going in the correct direction. Our trip involved mostly France, although we had a wonderful few days in Iceland on the way over, and a few days in Amsterdam on the way back. 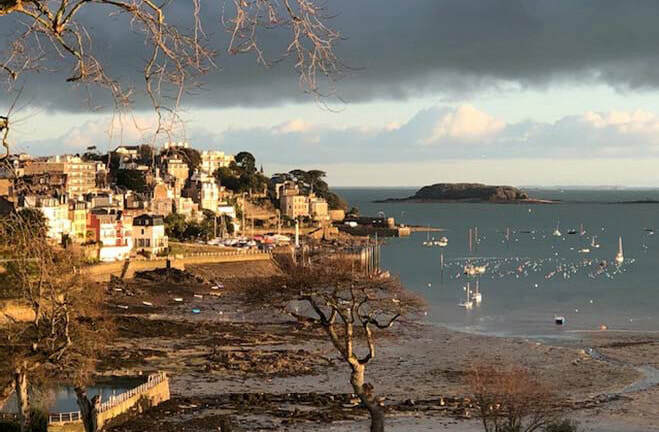 We focused on a couple of locations with longer stays on the Brittany Coast and in Paris, renting an apartment in both places and doing most of the meal prep and grocery shopping ourselves. We had an opportunity to sort of sink into and enjoy France. The overarching condition that must be communicated to our investors is that there is a tremendous amount of economic horsepower happening in Europe. It is busy. Even in the winter there are lots of people spending lots of money. Loads of construction plus many products being invented and manufactured. They are absolutely determined to create new and interesting results in the way of transportation, education, banking, and healthcare. Over the last couple of years our investments have shifted to more exposure in European companies than in the past. I am extremely pleased to be in that situation, especially since it helps us move toward companies that are comparatively less expensive than some of their counterparts in the USA. Thank you for putting up with the anecdotal research that we carried out whilst being consumers in a foreign land. It is the place to be and we should look forward to enjoying international investing results. What is a big infrastructure plan going to look like? How will the health care bill be rolled back? Will corporate tax reform take place? 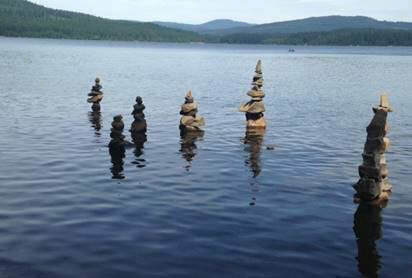 Timothy Lake. Photo by: Nathalie C.
Only one of these tasks was accomplished (barely), yet the equity markets marched to all-time highs. US stocks, measured by the S&P 500, returned 21.83% with international markets faring a bit better. We feel two acronyms can describe why investor euphoria continued in 2017 despite high valuations and continued geopolitical concerns: FOMO — “Fear of Missing Out” and TINA — “There is No Alternative.” Record low bond yields and paltry interest rates on safe haven investments have caused investors to reach for yield, raising already high risky assets, due to their fear of missing out and lack of an alternative to earn a satisfactory return. TINA can explain the most recent American Association of Individual Investors (AAII) poll where household allocation to stocks reached over 68%. This high allocation to stocks has not occurred since the late ‘90s, so clearly investors are feeling the need to reach for risk as fixed income and cash rates remain low. In our view, FOMO is the reason that many companies with little to no profits and high cash burns (Tesla and Netflix come to mind) trade at current prices. Other reasons given by financial pundits and talking heads on TV for the continued rise in equity prices are mostly noise and do not hold much water when analyzing the data. Ignoring the noise, FOMO and TINA, while sticking to our disciplined process, allow us to find ideas and investments that still offer attractive risk/reward traits. The silver lining is that not all companies are treated equally by investor euphoria, so we are still able to sift through the investment landscape and find bargains that the investment public has ignored. As an example, throughout the year we were focused on companies that had effective high tax rates that could benefit from tax reform. Many of these companies meeting that criteria are being cast aside over what we believe are excessive worries of competition and market share erosion. We are pleased with how our portfolios have done in spite of our conservative bias, as we continue to view the US market as expensive. We will continue to be vigilant in finding opportunities without losing sight of the fact that risks are higher than normal and preservation of capital is of equal importance while this nine year bull market matures. During the last week of December a new tax law was signed by the President. While there are many changes that are still being analyzed by tax experts, we want to touch on a few that we find meaningful. The Estate (Death) Tax exemption amount was raised to $11.2 million (indexed to inflation), per individual, starting in 2018. For filers using the standard deduction, charitable donations will not be tax deductible. 529 education plans became more flexible. Funds can now be used for K-12 expenses, up to $10k per child annually. Unearned income by a minor (Kiddie Tax) was previously taxed at the parents’ tax rate. The tax rates starting 2018 for unearned income by a minor will be the same rates used by estates and trusts. 2% miscellaneous itemized deductions were eliminated, doing away with the deductibility of tax preparation and investment management fees. The state and local tax (SALT) deduction is now capped at $10k per year. Again, these are just some of the changes that were signed into law. For any detailed questions on how the new tax law affects you, your professional tax preparer will have the answers. I’m going to pass it over to Tim so he can talk about something much more exciting: BITCOIN! Enjoy. Lately we’ve had a number of our investors ask about Bitcoin (big sigh). It seems to be in the news daily, whether it’s up, down or both. While there are many sources that can provide a deeper plunge into the inner workings of Crypto-currencies and Block Chain Technology, we’ll take a moment and give our perspective on this phenomenon. The reason it was created was to provide a secure and cheaply transferred currency useful to people and businesses worldwide. Despite its promise as a medium of exchange free from central banks and banking industry controls, it is not currently viable as currency for the ordinary human. Some reasons for this: Bitcoin is treated as any transaction that involves Bitcoin a tax may be due. Just as selling appreciated stock to buy a car will result in a 1099 for the capital gains, a “sale” of Bitcoin occurs during the conversion to dollars to facilitate the purchase of goods or services, which could result in a taxable event. Imagine getting a 1099 for the purchase of a sandwich! This is of course not happening, but it’s one of the novel effects that will need to be dealt with. In relation to the US dollar and other currencies, the value of Bitcoin is extremely volatile. Until prices of goods and services are quoted in Bitcoin across the globe, a conversion to traditional currency (i.e., US$, Euro, etc.) must happen in order to finalize transactions. This makes it unlikely that Bitcoin will be appropriate for widespread public use any time soon. Another issue for Bitcoin is that “depository” accounts used to hold it have been frequent targets for cyber theft; in some cases entire brokerage firms have been emptied of their Bitcoin. Normal monetary controls, developed over decades of experience, do not yet exist with Bitcoin; a fundamental benefit to some is a fundamental risk to others (think bearer bonds). VISA just cancelled a pilot program of Crypto-currency payment cards for some of these very reasons. In the sense that one can pay dollars for Bitcoin, and have more or fewer dollars at a future point in time, Bitcoin can be considered an investment, or at least has some features of investing. There is no way of measuring the value or potential value of Bitcoin in relation to the dollars one might invest, except by the market price at any given moment. There’s no productive enterprise being owned that may pay a dividend or rent, and otherwise have a widely agreed upon intrinsic value, as an investment in real estate, stocks or bonds would have. While Bitcoin holds promise for a future with a universal currency, it is unlike gold or other precious metals, which have held value to humans and governments for thousands of years and are unlikely to see this erode. Bitcoin and other Crypto-currencies are very new and it’s possible that they are but a transient experiment leading to something more permanent and useful in the future, in which case they will be worthless. We’ll see. Buy only what you can afford to lose! Enjoy the experience and learn from it. Don’t use the kids’ college fund! Company Spotlight :: Occidental Petroleum Corp.
Headquartered in Houston, TX, Occidental Petroleum is an international oil/gas exploration and production company with operations in the US, Latin America and the Middle East. The company operates three segments: oil/gas exploration, chemicals, and midstream/marketing. With the company for over 35 years, Vicki Hollub became CEO in 2016. ​Occidental Petroleum is the largest producer of oil in the Permian Basin (New Mexico and Texas). Since 2013 they have been reorganizing their asset base focusing on acquiring low cost, high return assets in the Permian Basin. This included spinning off their California oil/gas assets into a separate company, selling their non-core assets in the Middle East and North Dakota, further concentrating their effort in the lucrative Permian Basin. This strategy has strengthened the company’s profitability potential even if oil/gas markets come under pricing pressure. Occidental Petroleum also operates a chemicals segment, accounting for 35% of sales, manufacturing basic chemicals and vinyls. One of the largest Exploration and Production companies by market cap. Consistent and growing dividend with a yield of 4.46%. Occidental Petroleum is trading in line with their historical valuations and below fair value based on scenario analysis of free cash flow growth. Occidental has a dividend yield of 4.46% and generates over $1.3 billion in free cash flow, giving them the flexibility to continue to raise their dividend over time. The company forecasts their cash dividend will be raised if West Texas Intermediate (WTI) crude oil stays over $50 per barrel with the current dividend maintained at a WTI price above $40.00 per barrel. On a free cash flow basis, we expect the company to grow cash flow in the mid-single digits over the next decade, due to the company’s shift to higher margin assets. Modeling our conservative assumption places a price of $80 on the shares which is almost a 20% increase based on the share price as of the date of this report. If our conservative assumptions turn out to still be overly optimistic, we feel there is a margin of safety built into the current price based on the company’s strong cash flow generation and balance sheet. As we continue to monitor our investment in Occidental Petroleum, we would like to see continued discipline in regards to capital spending and their amount of leverage while continuing to grow their dividend. Continued focus on the company’s revenue breakdown and operating margins will be areas to monitor closely. Weighing the potential rewards and risks, we are optimistic that Occidental Petroleum will be a good ​long-term investment.